I have two finished projects to share this week. 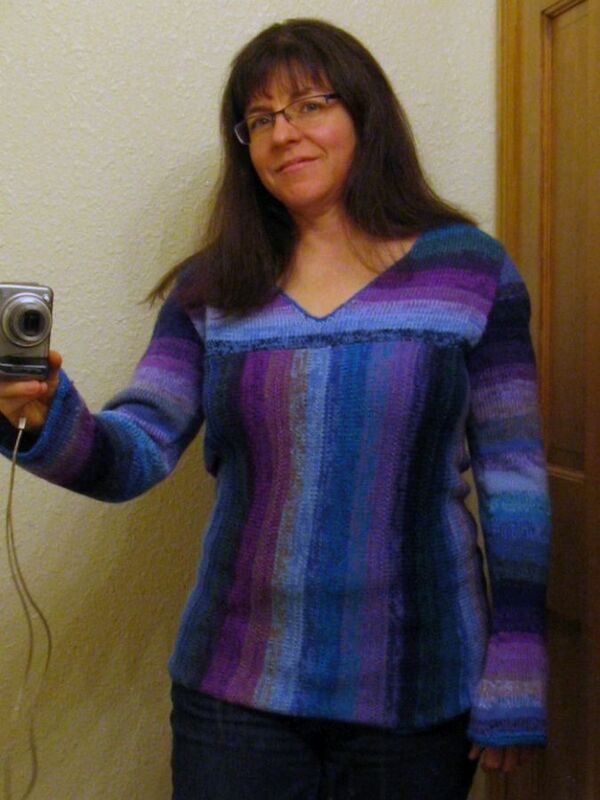 The first is the sweater I was making from leftover yarn. My decision to make the sleeves match worked out just fine. I didn’t run out of any of the colors I needed, but I did have a lot of ends to weave in when the knitting was done. Lots of yarn ends to bury; the downside of all those stripes. After I buried my loose ends, I stitched the sweater together. The last step was edging around the neckline and bottom edge, which was done with a crochet hook. The bad news: despite my heroic efforts, I still have yarn left. OK, maybe that’s not so bad. 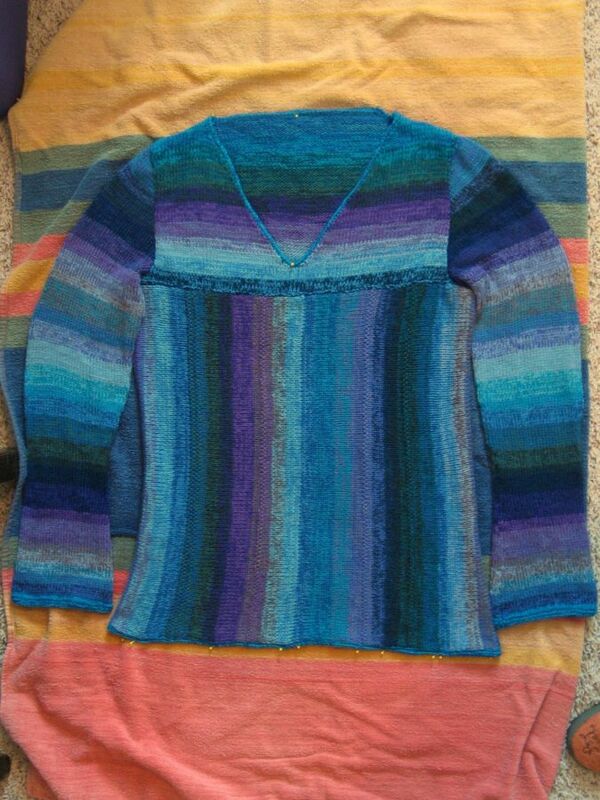 Also, now that the sweater is done, it’s 80° F out, and that’s not really bad news either. Since I live in Colorado, I can count on it to be cold and snowy again before the week is out. 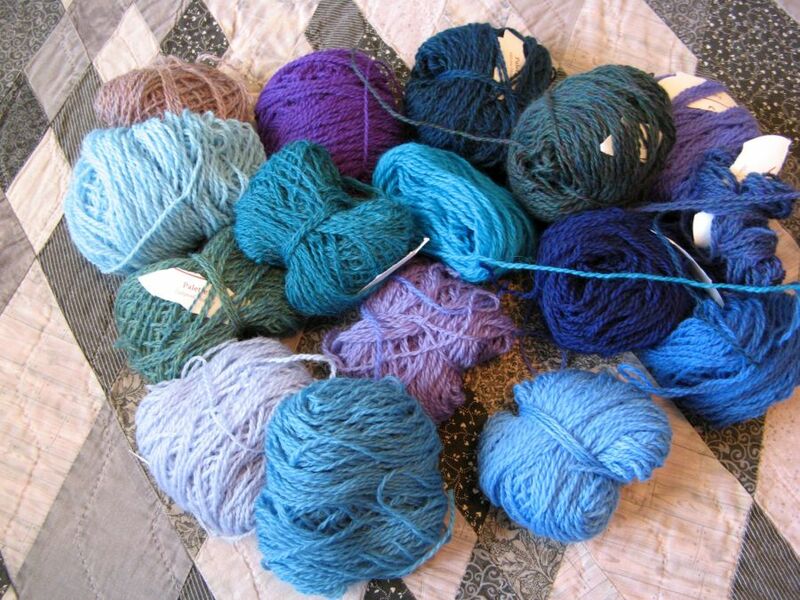 The leftover yarn that was left over… Will this never end? After my mini animal knitting adventures, I decided to switch to a different book of knitted animals. The patterns in Knit Your Own Zoo by Sally Muir and Joanna Osborne don’t make tiny animals, but they include plenty of realistic detail, which is something I love in a stuffed animal. 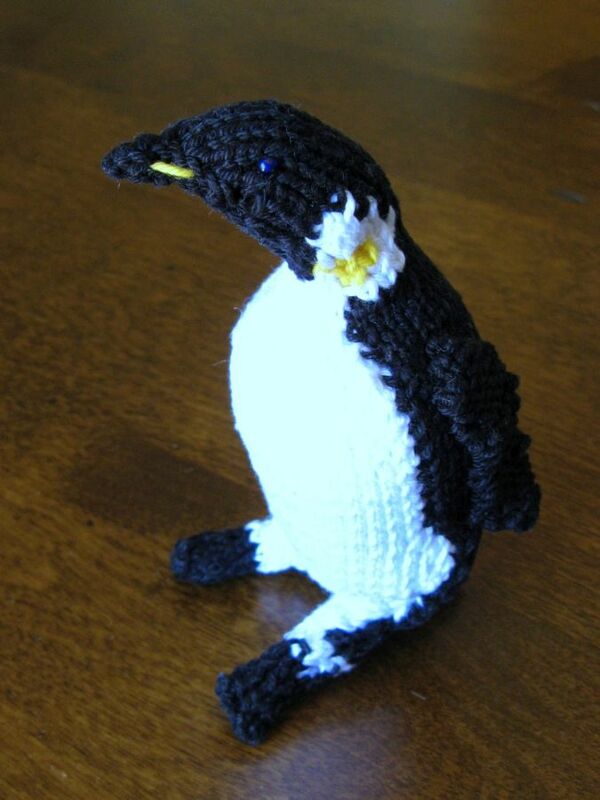 Since I had the right colors on hand, I got out my cotton yarn and knit the penguin. I had a bad moment in the middle of the project, but I can’t blame the directions. They were very clear (once I realized that the code letters that weren’t standard knitting abbreviations indicated the color of yarn to use). I just wasn’t paying attention when I picked up the leg and tail stitches for knitting the front. The legs and tail are knit first. The back and front are knit directly onto these parts, so it matters where you attach things, and which way the legs are turned when you do it. Fortunately, I caught the error quickly (“Why is his back on the inside instead of the outside?”) and it was easy to fix. Note to self: the legs should point towards the front. 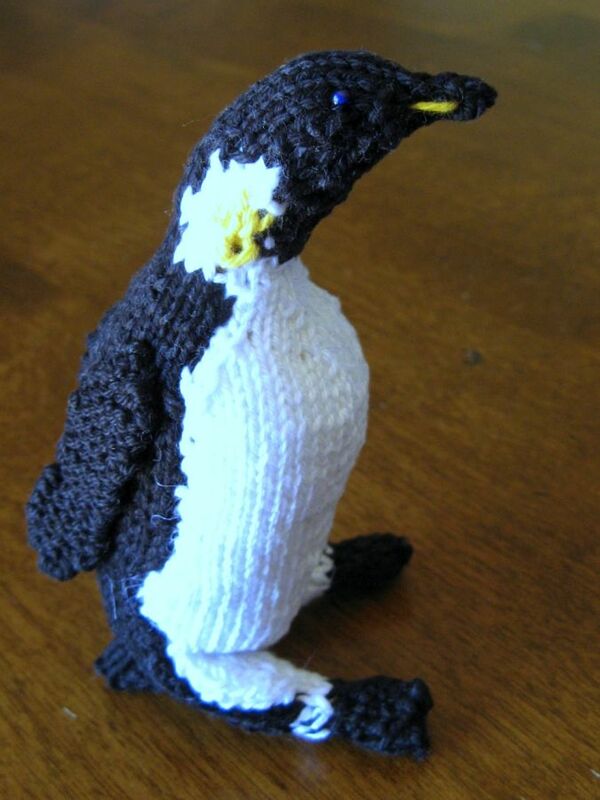 According to the book, the penguin should be 7.5 inches tall, but I used thinner yarn and smaller needles. He’s not mini but he’s not huge, either. Knit Your Own Zoo is full of animals I’m dying to make (including an armadillo and a fruit bat) and my first try was encouraging. Time to dig through my yarn stash and decide what yarns to use up to knit these fun furry friends. 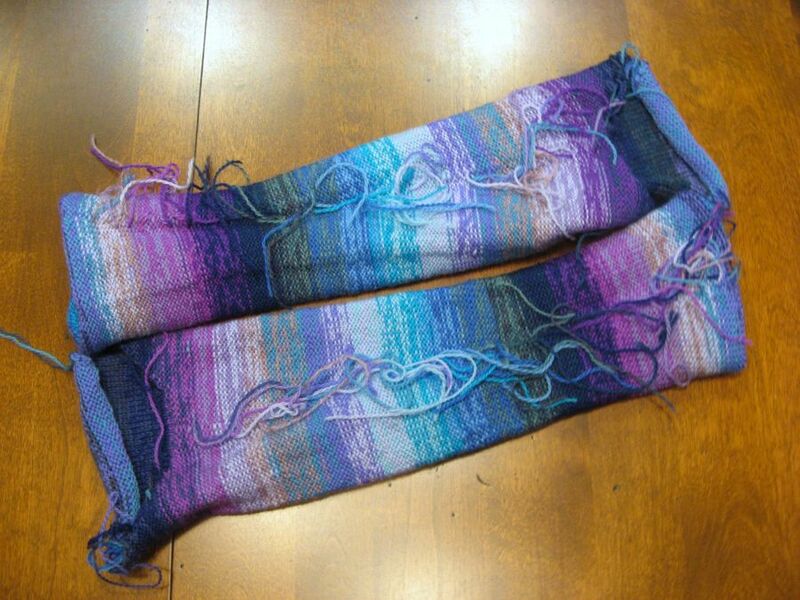 What’s your favorite way to use up leftover yarn? I’m leery of leftover sweaters. Socks, sure, but sweaters make me cringe. This, however, is lovely and looks quite intentional! Good thing you stick to coordinating colors. My leftovers vaguely resemble clown barf! I’m so impressed! I knit scarves and blankets, and have for about 6 years. The idea of making a clothing item, increasing and decreasing, is just baffling to me. I need to take a class because I would LOVE to be able to do it. I’ve been knitting since I was a teen, but most of my knitting has taken place in the last 25 years. A book with good pictures can teach you increases and decreases. They aren’t all that hard. Most decreases, you just knit or purl two stitches together. There are of course lots of ways to set up for that, but the simplest decrease is literally “k (or p) 2 tog(ether)”. I got a lot of practice making socks, which include increases and decreases. 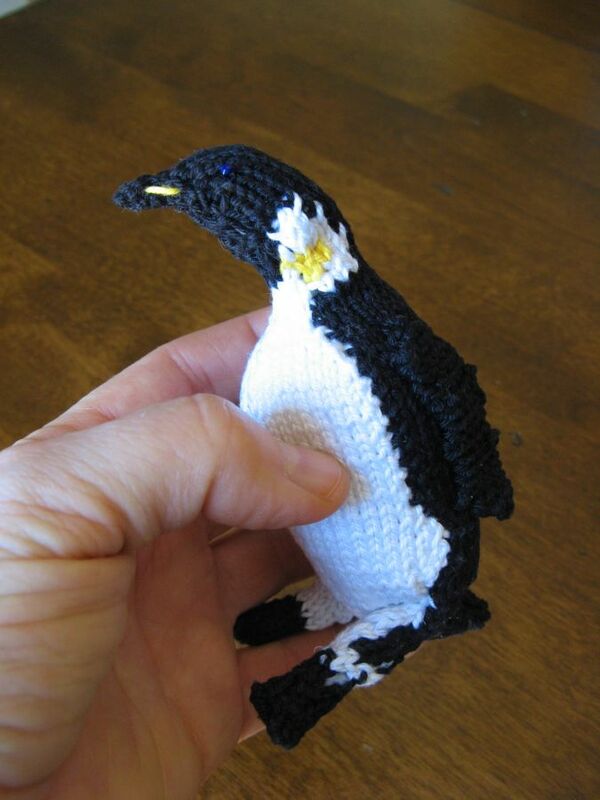 Or you can make little stuffed animals, which have shaping, are small enough to be finished quickly, and aren’t as intimidating as a sweater. And to that, I say WOW.